This part two in a two-part series on photo essays. Yesterday, I wrote about powerful essays that use just one or two images. Today, I’m going to talk about longer-form photo essays. You probably are familiar with these from online news sites which use slideshows of five to ten images to tell a visual news story. Nonprofits are adopting this storytelling format on their websites more and more. With visual essays you can have all the traditional elements of good cause-oriented storytelling: a strong main character, conflict, and the story of someone who wants to make the world a better place. The nonprofit charity:water is a master of visual storytelling. 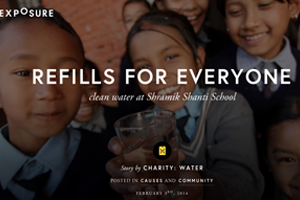 They used the photo essay blogging site Exposure to tell the story of how they brought clean water to Shramik Shanti School in Kathmandu, Nepal. This charity: water essay follows perfect visual storytelling narrative format which typically includes six elements listed below. Several of these elements can be combined into one image, and you can certainly tell a story with these six elements spread across twelve photos, too. A closing or resolution image. 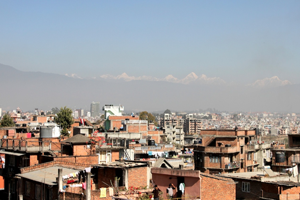 Charity:water’s Shramik Shanti School story begins with the opening shot of Kathmandu, showing the larger context of the story, giving a sense of place to the school situated in a dense, crowded city. The Exposure format provides a template that allows the blog post creator to have text to support the visual essay. As charity:water tells the story visually and verbally, they show the problem of dirty water and the need of the teachers and schoolchildren. Like a good story, they show the struggle of the characters. But, they still manage to be positive and hopeful. It doesn’t hurt that they have a solution and you get a behind-the-scenes look at the implementation of the solution and the happy faces after clean water arrives at the school. The photos convey the infectious energy of the children in a way that a text-only story would not be able to. See if you can find the image with the element of surprise. The close-up detail shot. The resolution shot. Note that they did not forget to put a donate button at the bottom of the essay, if you are so inspired to give to them! Photo essays can make a story much more interesting to read and consume – the adult version of the children’s picture book! Feature photo courtesy Flickr user Mumu Silva.